We had just come back from the excursion of Chilika Lake. I had witnessed the cleanest beach in my life at the sea mouth and I was filled with great joy and satisfaction that I decided to come to Odisha. We took rest for a while and then set out for the sightseeing of Puri. 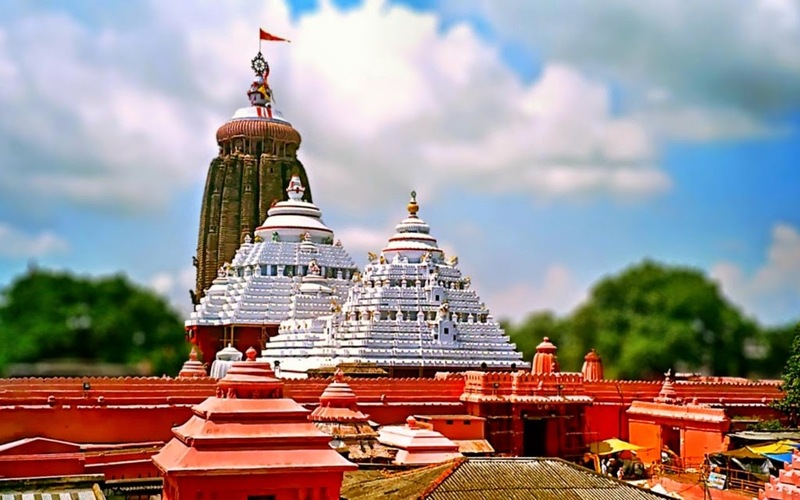 Puri (often called as Jagannath Puri) is primarily a pilgrimage town with famous temple of Lord Jagannath , one of the four dhams in India. Naturally we headed towards the temple first. 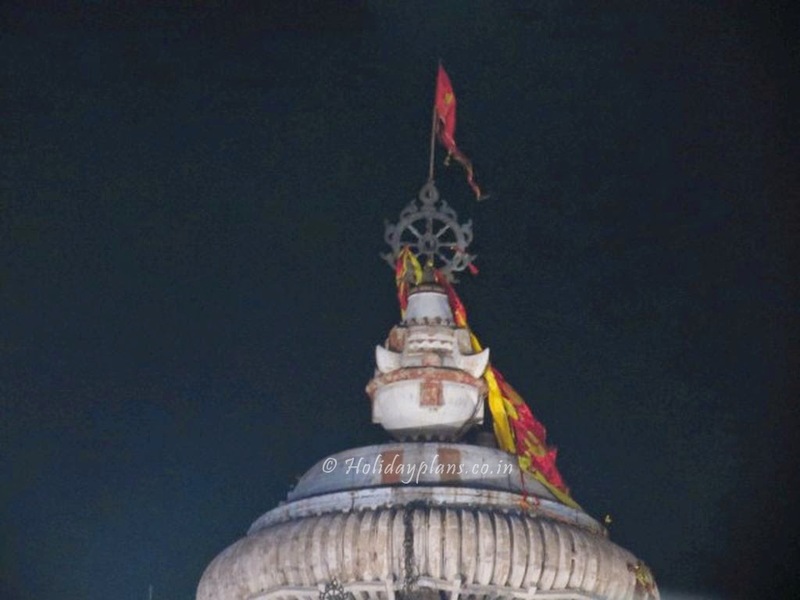 There is a very unique and interesting thing about the idol of Lord Jagannath. 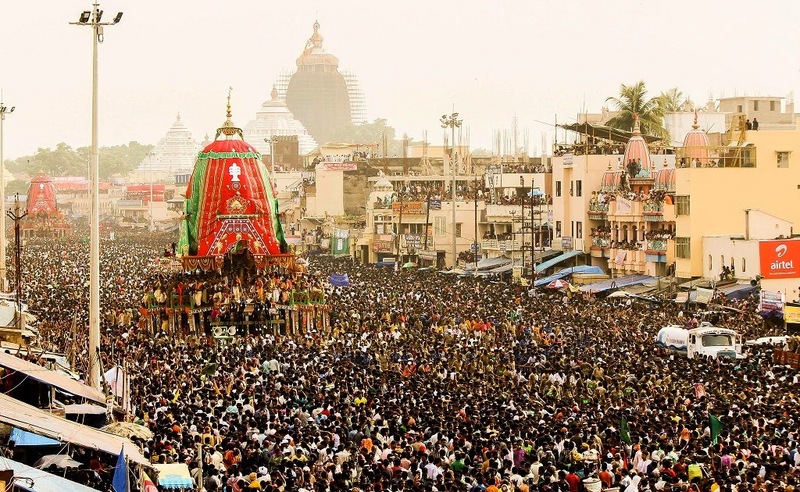 Generally all the Hindu deities are made of stone or metal, but that of Lord Jagannath is made from wood. This deity is replaced with a sacred tree wood every 12 years and is built to be the exact replica of the existing one. In order to reach the temple we had to park your car some 500 metres before the temple and from there we walked. The temple is dedicated to Lord Vishnu and we spotted a group of Krishna devotees dressed in saffron/red colored clothes performing dance and satsang kirtan just outside the temple. It was a good feeling and we danced along too. The temple premises are majorly built using large stones. The main temple consists of three different idols viz. 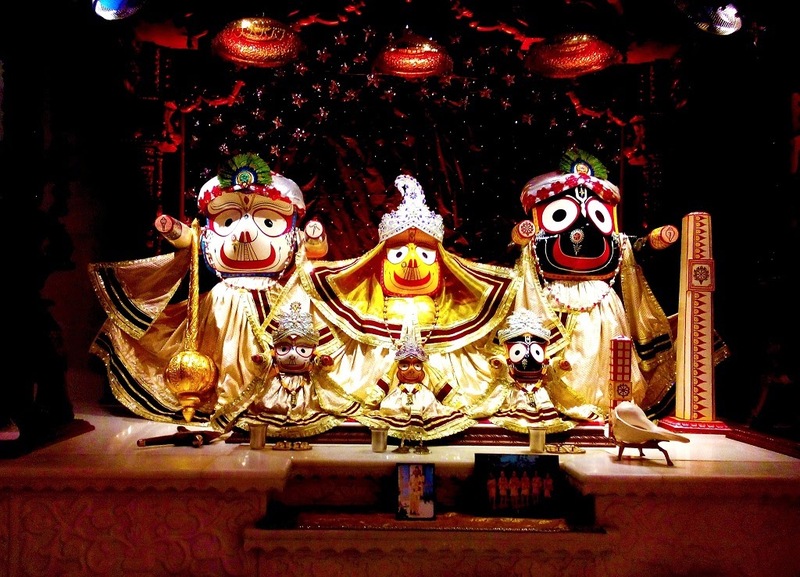 Jagannath , Balbhadra and Subhadra which are considered to be the forms of Vishnu , Balarama and Subhadra(half-sister of Krishna) respectively. The ritual chakra (Nila Chakra) on the shikhar of the temple are also related to the Sudarshan Chakra of Lord Vishnu. 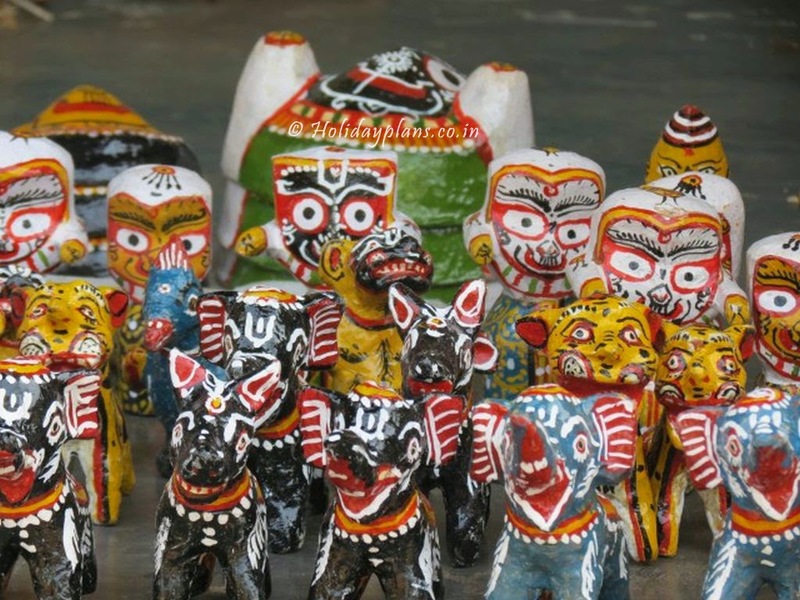 It symbolizes protection by Shri Jagannath. 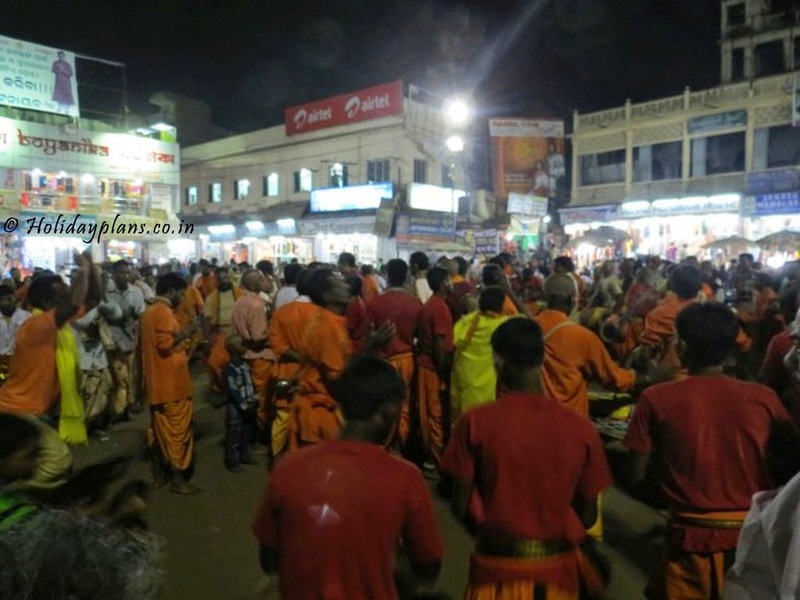 After having the darshan, it was already late evening and we decided to move towards the area of Puri beach. Although it was dark but there were still a lot of people at the beach. People were having a leisure time on the beach with their families. We removed our slippers and started walking on the wet sand. 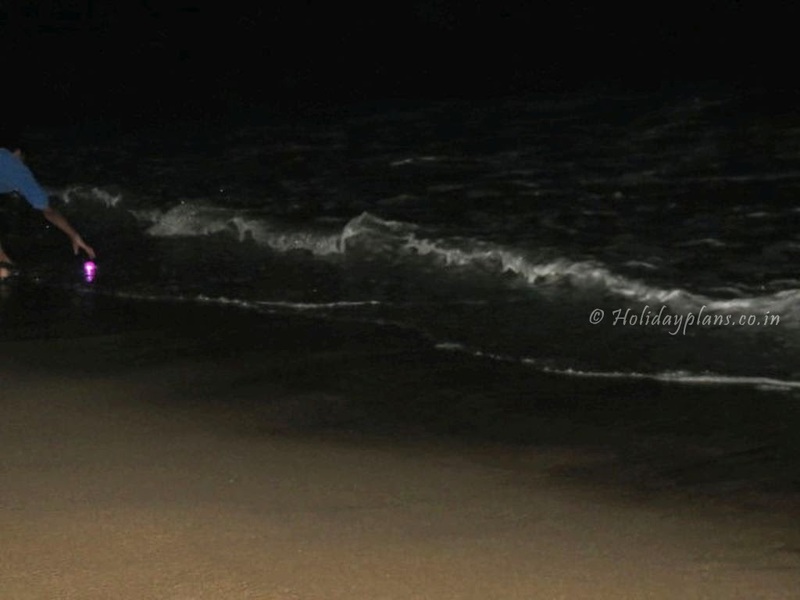 I had visited lot of beaches in day time or sunset time but for the first time I was visiting any beach in night time and it seemed different. 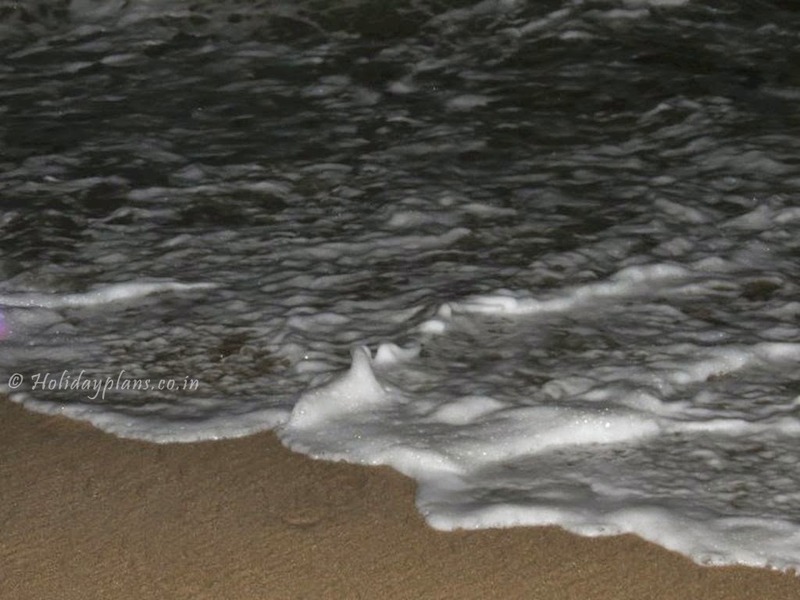 The waves were more ferocious and were rising to a great height as they rise in day time. 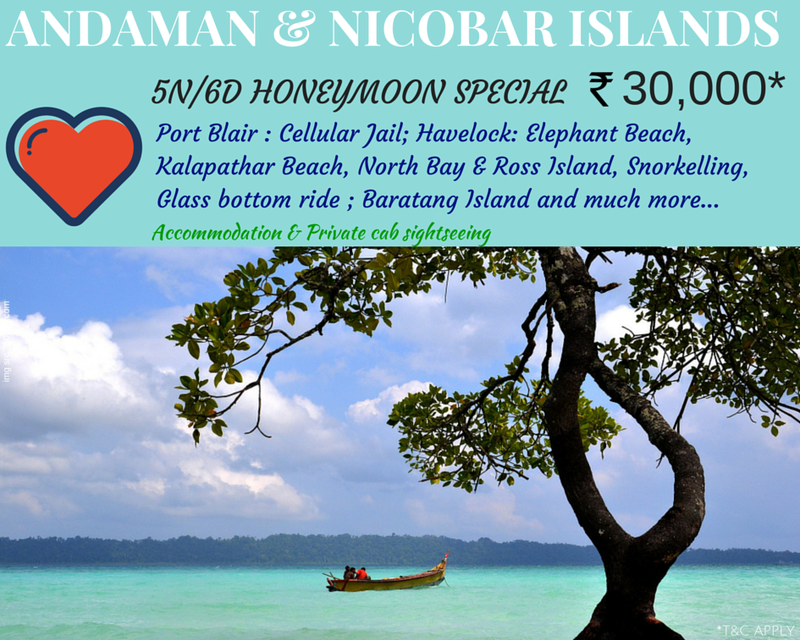 The deafening roar of the waves and cool breeze on the face, it all set up the mood and we were feeling refreshed. As we moved a bit further we noticed that there was an open air cultural program going on near the beach. The board on the stage read “19th Glory Fest”. We enjoyed the cultural program and then left for the dinner in a restaurant near beach. It had been late by the time we finished our meal, so we decided to call it for the day and we moved back to the hotel. 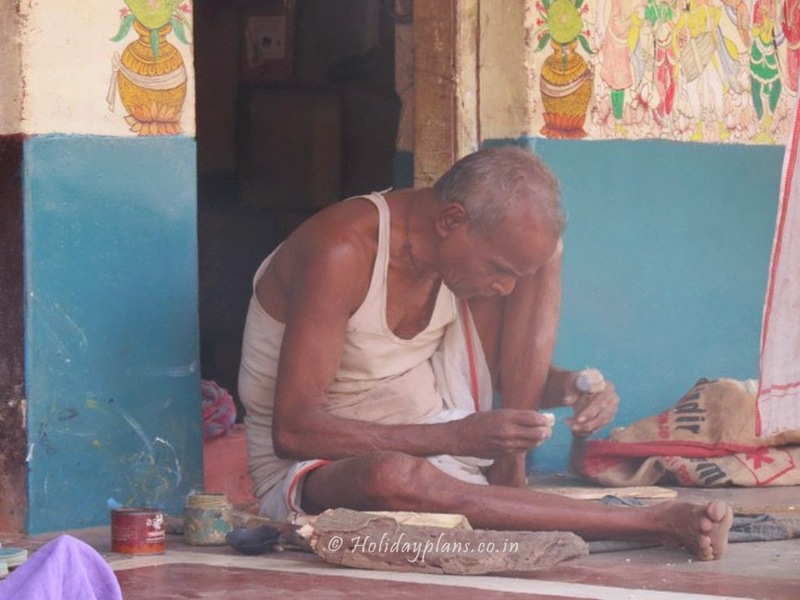 The next morning I had planned to move towards Bhubaneshwar via Raghurajpur – a Heritage village famous all over India for its handicrafts and “Patta Chitra”. Raghurajpur is a small village which is different from all other villages of the state. 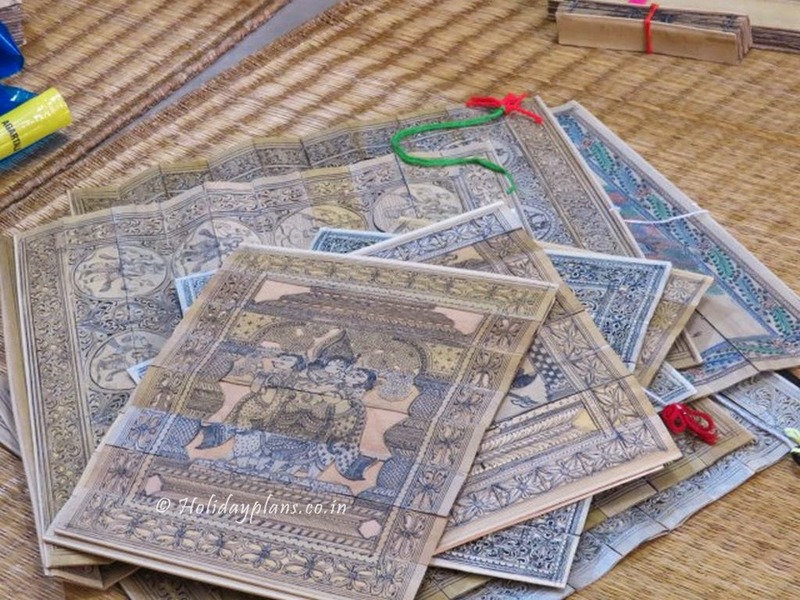 It is well known for community of artisans who produce varieties of handicrafts items such as Patta Paintings, Palm leaf engravings, Stone carvings, Paper made toys and masks, Wood carvings, Wooden toys, Cow-dung toys, Tasser Paintings etc. This is what makes this village perhaps the only place in India where such variety of art is present at one place. We stopped by this village to have a look on the famous Pattachitra paintings. The entry is just like any other village but the difference is that you can see handicrafts and artistic things in every single house of the village. We sat in one of the houses and quickly went through the marvellous pieces of handicrafts by the talented people of Raghurajpur. We purchased a lot of handicrafts for our friends and families. Quick fact: Pattachitra is a general term for traditional cloth-based scroll painting. 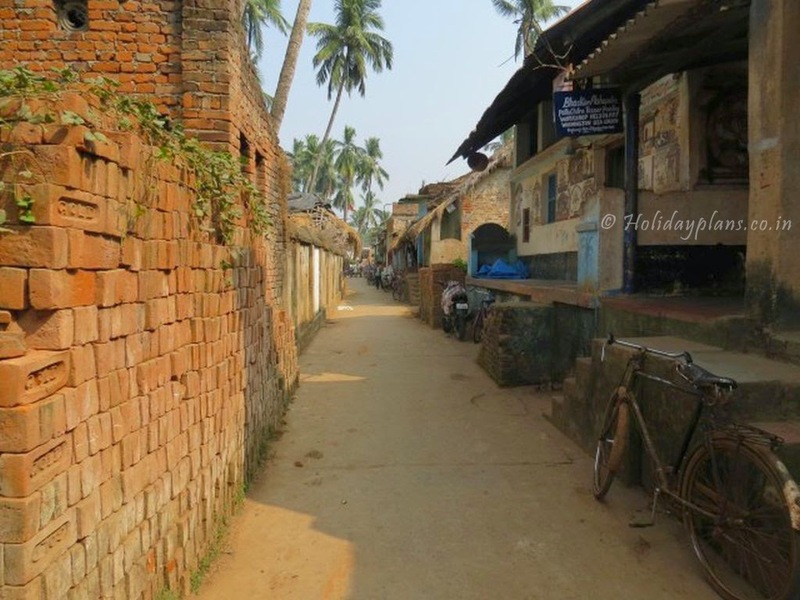 The Jagannath Temple of Puri and the Heritage Village of Raghurajpur made me experience a different India altogether. It was like I have never seen or experienced before. Far away from the pomp and show of the bustling cities and having their own tradition, stories and culture. It added to my bag of experiences and did a lot of good to my spirits. We will visit Bhubaneshwar – the capital city of Odisha in the next article! Till then Keep Blogging and Happy Holidaying! To book a customised tour to Puri and Raghurajpur, feel free to get in touch with us. Stay connected for the next article. Readers please share your feedback in the comments section below.